The picture is designed to make the "new way" of teaching subtraction look excessively confusing and irrational. Surely doing one big subtraction problem is easier than doing four addition problems, right? Well, first let's be honest: Even though the "old" way looks more concise, it is technically two subtraction problems: the first occurs as we subtract 2 from 2 in the "units" column, the second occurs when we subtract 1 from 3 in the "tens" column. But still, isn't four addition problems more work than two subtraction problems? In this post, I'd like to argue that the so-called "new way" of teaching subtraction is not only exactly the same as using an abacus (which tends to confuse laymen who are largely unfamiliar with what the beads on an abacus are supposed to mean), but it is also totally identical to what you were taught to do as child, no matter how old you are. What's Going On In The Picture, Anyway? Many people have said they don't understand where the numbers are coming from in the "new way." So let me briefly explain. We all know it's easier to perform arithmetic on multiples of 5s and 10s than on other numbers. This is the whole logic of the metric system. So the purpose of the "new way" is to leverage the ease of using 5s and 10s in order to solve trickier arithmetic. When I was growing up, we were given "extra credit" problems that attempted to teach us that if we wanted to know what 107 + 54 is, one you can get close to the answer in your head by rounding 107 up to 110 and 54 up to 55. So you get 165 and subtract out the 3 and the 1 (which you used for rounding) to get 161. To be sure, some kids respond better to this kind of logic than others. Some kids see this as a shortcut. I always saw it as being a little excessive. But I concede that rounding works well for a certain kind of thinker, and that's the important part. Start with the smaller number, which is 12. Round up to the nearest multiple of 5, which is 15. Round up to the nearest multiple of 10, which is 20. Count up by 10s until you get close to the larger number without going over; this brings you to 30. Finish off the count to the larger number, bringing you to 32. To go from 12 to 32, you had to "count up" 3 (to get to 15), 5 (to get to 20), 10 (to get to 30), and 2 (to get to 32). So the picture tells us that the answer is 3 + 5 + 10 + 2 = 20. That's the logic behind it. If you think about it, this is not at all any different than what you were taught when you were learning simple subtraction problems as a child. If your experience was like mine, when your teacher gave you a problem like "5 - 3," you were probably told to announce to the universe, "Three!" Then you'd stick out one finger and say, "Four!" Then you'd stick out a second finger and say, "Five!" Counting upwards from 3 to 5 on your fingers thus gives you a result of 2, at which point you would say to your teacher, excitedly, "Five minus three is two!" And you'd get a gold star. Well, if you understand the logic of counting on your fingers, then you understand the logic of the method described by the photo above. The only element added in this case is the fact that doing larger problems will require you to count by 5s and 10s once you run out of fingers. Really, think about it. To get from 12 to 20, you need 8 fingers. You can use your last two fingers if you want to, but that only takes you up to 22. As adult, you'll quickly know to add an additional 10; but of course as an adult, you also know that the answer is 20 without having to think about it. Put yourself in the place of a child who does not know how to do multi-digit subtraction problems yet. So you count up to 20; and as a child you know that 20 and 30 is easy, it's just another 10. And then you just have to count on your fingers again to get from 30 to 32. So really, all we're doing here is counting up, just like you were taught to do decades ago. The only difference (heh, get it? difference?) is that instead of running out of fingers, you just round up and count by tens, and then count up to the final number. Thus, the picture above is nothing more than a pictoral representation of counting on your fingers - but without the fingers. It's exactly the same method. It's "counting up." Identical. This, by the way, is the whole logic behind an abacus. Only, instead of fingers, we have nine beads on a string. Once you run out of beads, you move up to the next string, which represents the next set of digits. So, 1-9 are on the first string, then you move one bead over on the next string to get 10. Then you count 1-9 on the bottom string again for numbers 11-19. Then you move a second bead on the second string to get 20. Continue this process until you run past the 9th bead on the second string, and then move up to the third string and move one bead over: That's 100. And so it goes. 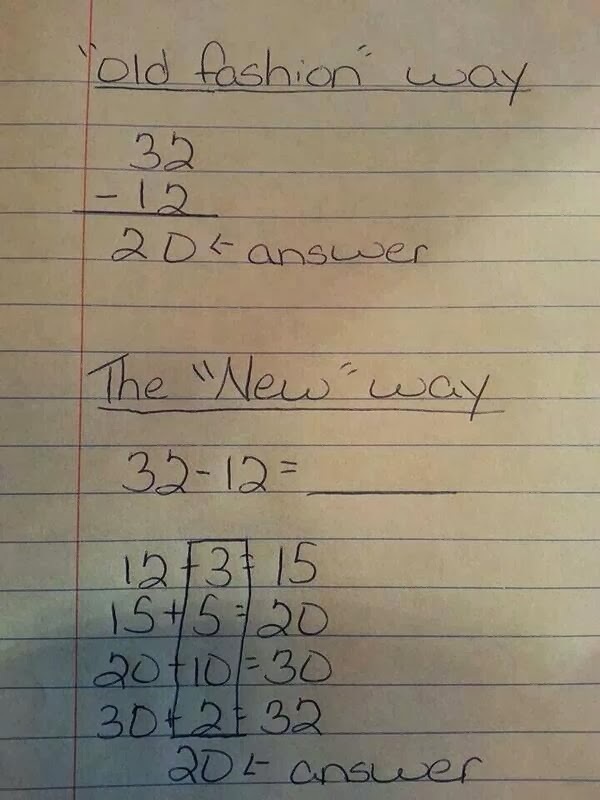 This "new way" of teaching subtraction just means you're starting on your abacus at 12. You move 7 beads on the bottom string and one bead on the second string to arrive at 20. Then you move another bead on the second string to arrive at 30. Then you move two beads on the bottom string again to arrive at 32. If you moved your beads correctly, your abacus should show you a value of 20, and you have your answer. It's been a long time since anyone taught children to properly use an abacus. It is an archaic tool, moreso even than a slide rule - which people my age have only heard about and never used. But that doesn't mean the logic behind the abacus is irrelevant, useless, or needlessly complicated. Using an abacus is just a handy-yet-primitive way to perform arithmetic calculations. Its being "handy-yet-primitive" is precisely what makes it such a valuable tool for learning, which is why it's still possible to buy abacuses at toy stores. One advantage that abacuses offer is that they are visual: you can actually see the digits "move" as you count them, so you can internalize logical concepts with a visual indicator. This "new way" of teaching subtraction, by contrast, utilizes the same technique as the abacus, but without the visual indicator. In that sense, it is inferior to the abacus, but not at all inferior to the method I was taught when I grew up. But it does look different than what I was taught, and this may be why people on my Facebook feed have had such a hard time understanding what's going. Initially, I myself rejected the "new way" as useless, but the more I thought about it, the better I liked the intuition behind it. So count me among the fans of this new way of teaching subtraction.